If you buy any of our current interfaces software activation is not required! VAG-COM will become fully registered / activated as soon as you test it on a car with one of these interfaces. If you bought a Dongle Interface (such as a KEY-, HEX-, or MICRO- series) directly from Ross-Tech, you do not need to register it. You are already registered! If you bought your Dongle Interface (such as a KEY-, HEX-, or MICRO- series) through a distributor you should to submit the this form in order to become eligible for tech support. When you first download and install VAG-COM, it will be in "Shareware" mode. It will access all the control modules in your car and perform a number of useful functions, but some functionality is blocked until the software is registered and activated. VAG-COM generates a unique software Serial Number on each computer where it is installed. In order to to Activate VAG-COM, you must provide the Serial Number that VAG-COM shows on the computer on which you intend to use it!. You will find the serial number on the "About" screen of the program. Please test VAG-COM to make sure it communicates properly with all the systems in your car. You can do quite a bit without activating the program! VAG-COM registrations for "dumb" interfaces are not refundable. If you are not sure if it's working properly, ask us! All Activation requests must be made via the appropriate registration form. Requests sent by e-mail or fax will not be processed. We try to process all activation requests as quickly as possible. Please do not call right after submitting your request asking to have it expedited. This will not help. Remember: "Poor planning on your part does not constitute an emergency for us!" Please use Copy and Paste with all serial numbers and activation codes to avoid typographical errors! If you can't access the Internet from your laptop, copy and paste the serial number into a text file using the Notepad program on your laptop. Save the file to a floppy disk, CD, or USB Memory Key and take it to a computer from which you will be filling out our registration form, and copy from the Notepad file into the Form. Reverse this process when you receive your Activation Code. Go to the About screen of VAG-COM, where you will find the Serial Number. Highlight the Serial Number by double-clicking it with your mouse. Then, right-click the highlighted area and select Copy. This will copy your Serial Number into Windows Clipboard, so you can paste it somewhere else. ... then you need to TEST VAG-COM as described in our FAQ. Go to our appropriate registration form and and find the field for "VAG-COM Serial Number:" Right-click on the white area and select Paste to paste the Serial Number into the appropriate area. Fill out the remainder of the form and submit it. You should receive your Activation File via email by the end of the next business day after submitting the form. "End of day" can be late in the evening sometimes. If you have not heard from us by the second business day after submitting your request, please follow up with an e-mail to Activation@Ross-Tech.com or give us a call. Once you receive your Activation Code, go to the Register/Activate/Transfer Screen in VAG-COM. Enter the Activation Code and click the [ Activate! ] button. Again, please use Copy and Paste to avoid errors when entering your Activation Code. Once you have entered a valid Activation Code, the Activation Code field should be disabled and say "Already Activated". If you do not know how to copy and paste, please see our Handy Tutorial! If VAG-COM won't accept the Activation Code we've sent you, the error message will always give you a "Reason" code. If you're going to tell us that it didn't work, please be sure to give us the "Reason" code! 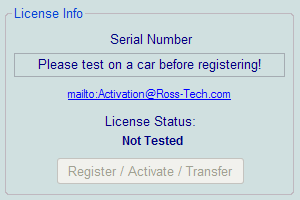 When we send out an activation code, we always include the Serial Number that it was generated for. Before entering the Activation Code, please make sure the Serial Number hasn't changed (all you need to look at is the last four digits, if they are the same, the rest is the same too). If the Serial Number is not the same, do not enter the activation code; contact us instead. If you absolutely cannot use Copy & Paste to enter the code, make sure you view the code in a font other than Courier. Many e-mail program display mail in Courier, which is the font in this paragraph. The problem with Courier is that there is often no visible difference between l (lower-case L) and 1 (one).